First Order Stormtrooper's helmet is equipped with an integrated comlink, audio pick-up, two artificial air-supply hoses, and a broadband communications antenna powered by a single power cell. It has a built-in filtration system to extract breathable atmosphere from polutued environment. 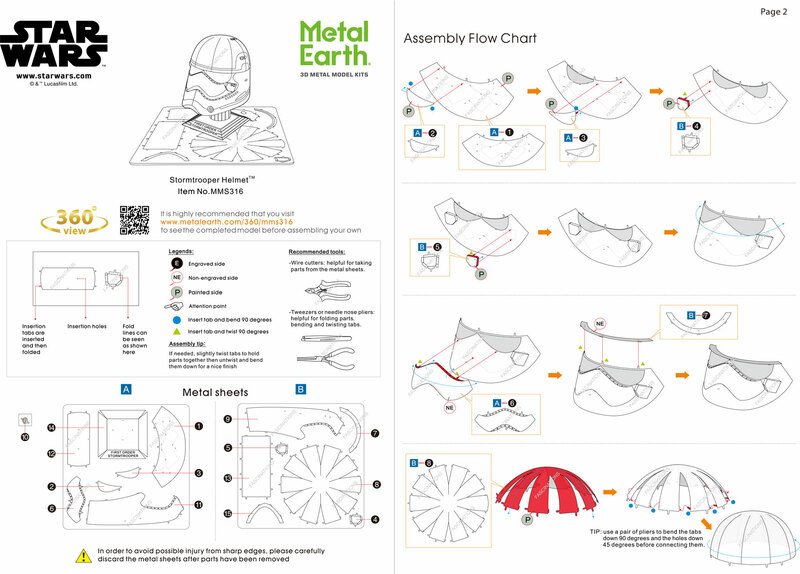 Build your own First Order Stormtrooper Helmet from Star War with ease with this Metal Earth Star War kit from Fascinations. This amazingly detailed etched model starts as 2 4-inch square steel sheets and finishes as a 2.36"L x 1.97"W x 2.91"H 3D model. Simply use the easy-to-follow instructions included with the sheet to pop out the pieces, bend the tabs, and connect them at the attachment points. No glue nor solder required.